This is the Civil War Santa figure. It is from the History of Santa Claus collection. It is approximately 12 tall and is in very good condition. It come with a brochure. Do not miss out on this very hard to find piece! 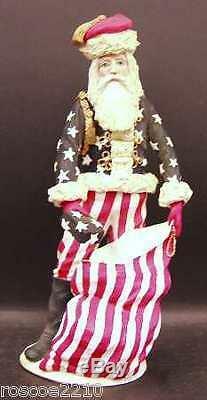 The item "Duncan Royale Civil War Santa Figure -History of Santa Claus-12 Figure- RARE" is in sale since Monday, November 12, 2012. This item is in the category "Collectibles\Decorative Collectibles\Decorative Collectible Brands\Duncan Royale". The seller is "roscoe2210" and is located in Lanesboro, Minnesota. This item can be shipped worldwide.